Today I finally went to check out the cycle path. Now, when I said “in Cambridge”, I actually mean “in the middle of a field just outside Cambridge”, but I’ve noticed that that is pretty much true for everything in Cambridge. I mean in the middle of fields. This weekend, for example, is also the annual outdoor film screening in Cambridge. It is also in the middle of a field outside Cambridge. I was all excited about it (films! outside!) until I figured out that part. So instead of going to that field, I went to another field to look for the cycle path. With help of my iPhone I found the cycle path, but… it looked normal. Both ends had an information sign as well. 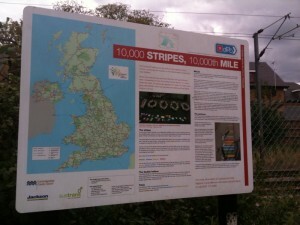 The path was opened in 2007, and includes the 10,000th mile of cycle path in the UK. 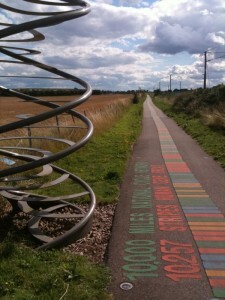 The nearby Sanger institute (famous for its genome sequencing) suggested to decorate the path with a gene, and BRCA2 was chosen because it has approximately 10,000 base pairs, but also because it’s a gene that people can relate to. Genetic screens for breast cancer risk are something that people will have heard of, and this is the gene that those tests look at. Now what we still haven’t figured out is: is the gene on the BRCA2 cycle path the healthy version, or a concerning mutation? If I’m ever really, really, bored, I might decode the whole path and find out. Cambridge _is_ the middle of a field. HTH. Åsa, it took me longer to get from my house to the cycle path (about 20 minutes) than to ride over it (less than 10). It’s really unfortunate that the start of it is so remote, otherwise I’d recommend it to anyone visiting. But it would require a bus trip and long walk from the centre of Cambridge. You can see it from the train, though, but very, very briefly. Richard, yes, indeed. And I don’t like it, and never will, and will readjust my monthly budget to accomodate more frequent train trips to London. I just realized (yes, I’m slow) that the Shelford end is definitely the “end”, and not another relative “start”, because the ATG codon is at the marker near Cambridge. Now it makes even less sense that it starts in the middle of nowhere… _why_ Cambridge, WHY??? A friend of mine who cycled that bike path almost every day, as a postdoc, swore that the prevailing wind blew against him, both to and from Addenbrooke’s. It sounds windy in your video, too. Within the next two years, it may be possible for me to cycle into work, using bike paths that run along (usually) dry riverbeds. Then I will have no excuse. Maybe they think there will be more development in the fields at the Cambridge end so they started it further out. Future proofing sort of thing. One of the science centres I work in has a really nice gate on a random street corner (it’s technically the back gate) because one day the bypass road is expected to go past there. It’s been there for at least 12 years that I remember, maybe longer, and the route of the road still hasn’t been finalised. 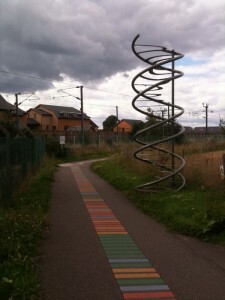 Are there any other paths like this, with science themes? I guess a sequence lends itself to this kind of treatment. We definitely need one (or several) around London. Matt? London Science Festival? Doesn’t it start from there because the 10000th mile lies at that part of the road? Anyway they could still cheat a little bit, or drew the lines thicker.